S Hillary, pope: “Children, how hard it is to enter the Kingdom of God!" What God commands he makes possible by his grace. Sunday Wk 8: "do not worry"
Anxiety is born of materialism and obsession with money. We do need to eat and the protection of clothing and shelter, but we are more than these. When we become mired in concern for earthly wants our deepest needs, for spiritual realities, for God, are unmet and we become unhappy. The answer for those who crave peace is to hand themselves over to the Father in total trust as does Christ. The power of Faith is experienced in the strength to refuse worldly preoccupations that feed doubts which corrode our faith. To be strong in Faith is to reject the sources of anxiety that leave us vulnerable to the wiles of the evil One. Art: Hildesheim Cathedral, Christussäule: The miraculous feeding of the multitude, ca. 1020. Saturday, Wk 7: "God from the earth created man"
... and in his own image he made him.
" 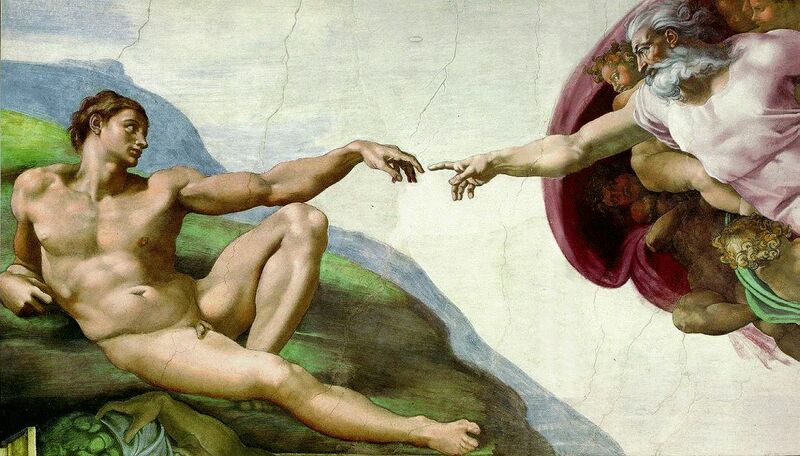 'God created man in his own image, in the image of God he created him, male and female he created them.' 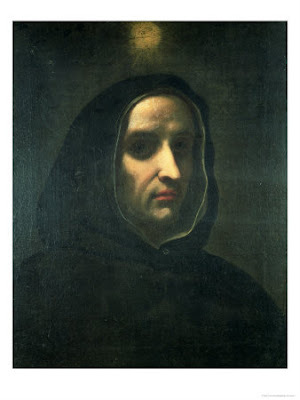 Man occupies a unique place in creation: (I) he is 'in the image of God'; (II) in his own nature he unites the spiritual and material worlds; (III) he is created 'male and female'; (IV) God established him in his friendship. Friday, Wk 7: "A faithful friend is a sturdy shelter"
Thursday, Wk 7: "Rely not on your wealth"
All bow down before wealth. Wealth is that to which the multitude of men pay an instinctive homage. They measure happiness by wealth; and by wealth they measure respectability. . . . It is a homage resulting from a profound faith . . . that with wealth he may do all things. Wealth is one idol of the day and notoriety is a second. . . . Notoriety, or the making of a noise in the world - it may be called "newspaper fame" - has come to be considered a great good in itself, and a ground of veneration. S Peter Damian: "All wisdom comes from the LORD"
God's almighty power is in no way arbitrary: "In God, power, essence, will, intellect, wisdom, and justice are all identical. Nothing therefore can be in God's power which could not be in his just will or his wise intellect." and do not turn your back on one who wants to borrow." All that we have, both material and spiritual, are gifts from the heavenly Father, on loan as it were and to be shared with all. Every human person is a sister or brother. The love of Christ demands of us that we treat them as such. "The principle of solidarity, also articulated in terms of 'friendship' or 'social charity,' is a direct demand of human and Christian brotherhood. Within our liturgy, the highest prayer of the Christian people, we have the collection and the offering of our gifts, to include monetary ones, as an expression of the love of Christ and a means of solidarity with everyone in need of any kind. "Those who are well off, and who are also willing, give as each chooses. What is gathered is given to him who presides to assist orphans and widows, those whom illness or any other cause has deprived of resources, prisoners, immigrants and, in a word, all who are in need." St. Alvarez of Corova: "he led them...up a high mountain"
... it is good that we are here! Jesus often draws apart to pray in solitude, on a mountain, preferably at night. He includes all men in his prayer, for he has taken on humanity in his incarnation, and he offers them to the Father when he offers himself. Jesus, the Word who has become flesh, shares by his human prayer in all that "his brethren" experience; he sympathizes with their weaknesses in order to free them. It was for this that the Father sent him. His words and works are the visible manifestation of his prayer in secret. Il Beato Angelico / Blessed Fra Angelico: "the plan of the LORD stands forever"
... the design of his heart, through all generations. Sacred art is true and beautiful when its form corresponds to its particular vocation: evoking and glorifying, in faith and adoration, the transcendent mystery of God - the surpassing invisible beauty of truth and love visible in Christ, who "reflects the glory of God and bears the very stamp of his nature," in whom "the whole fullness of deity dwells bodily." This spiritual beauty of God is reflected in the most holy Virgin Mother of God, the angels, and saints. Genuine sacred art draws man to adoration, to prayer, and to the love of God, Creator and Savior, the Holy One and Sanctifier. Seven Founders of the Order of Servites: "the peoples gather together"
... and the kingdoms, to serve the LORD. "From the God-given seed of the counsels a wonderful and wide-spreading tree has grown up in the field of the Lord, branching out into various forms of the religious life lived in solitude or in community. Different religious families have come into existence in which spiritual resources are multiplied for the progress in holiness of their members and for the good of the entire Body of Christ." 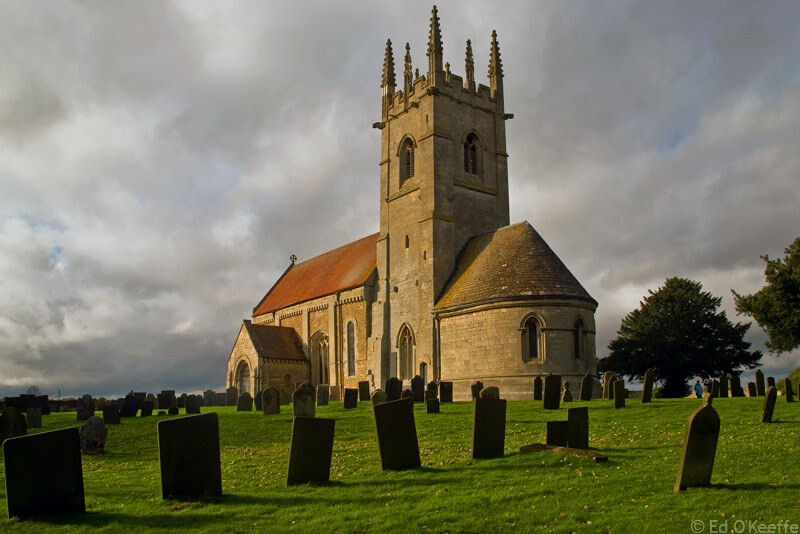 St Gilbert of Sempringham: "My vows to the Lord I will repay"
... in the sight of all his people. Mother Church rejoices that she has within herself many men and women who pursue the Savior's self-emptying more closely and show it forth more clearly, by undertaking poverty with the freedom of the children of God, and renouncing their own will: they submit themselves to man for the sake of God, thus going beyond what is of precept in the matter of perfection, so as to conform themselves more fully to the obedient Christ. St Gilbert of Sempringham, pray for us. St. Claude la Colombière. "... great was man's wickedness on earth"
...you alone have I found to be just on earth. From the very beginning God blessed all living beings, especially man and woman. The covenant with Noah and with all living things renewed this blessing of fruitfulness despite man's sin which had brought a curse on the ground. 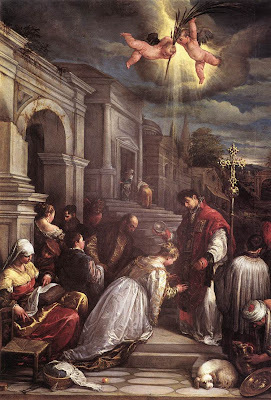 As Saint Valentine's Day approaches those with significant others are sometimes shrilly reminded, not necessarily by their "Valentine", that they had better send chocolates, flowers or a card to the object of their love if they want such person to remain that way. The commercialization of love around this time of year is amusing to many and perhaps some are grateful for the reminder to send a sign of their affection to a loved one. But there others who, during these days of celebration of the affairs of the heart, are reminded of Valentines loved and lost, perhaps even finding themselves bitter in a state of disappointment and disillusionment. These include the not insignificant numbers of those with failed marriages which we are told increases with time. Divorce is always a tragedy and those who suffer it must be approached with pastoral solicitude and lovingly supported in every way possible in the Christian community. The truth, however, must also be spoken with regard to the difficulty of their situation, for this too is the ministry of the love of Christ. The numbers also of those who seek declarations of nullity in the United States are many. This acknowledgment of the laws of Christ with regard to marriage is a positive indicator. But not every marriage that ends in divorce is for that reason also necessarily invalid. That remains to be proven in each case. The Church always presumes in favor of the marriage. The process of submitting a marriage to a church tribunal is thus for the purpose of proving that a marriage never existed from the moment that the couple exchanged vows, ideally in church and before priest and people. This process is not assured. Evidence is sometimes lacking. In such a case the couple remain married, the legal declaration of divorce having no standing in a sacramental sense. This means that such a couple cannot marry anew, because the two remain married to each other. And, because they are married, neither can they "date" anyone else. 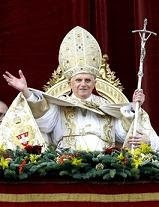 Such persons sometimes react with anger, blaming the Church for their state of affairs. But actions have consequences, including the decision to marry. The laws which Christ came to fulfill include the laws of marriage, about which He was most clear. One man can only be married to one woman at a time and vice versa. Marriage is "indissoluble", that is, it cannot be broken once joined as Christ taught: "What God has joined let no man put assunder". "- not impeded by any natural or ecclesiastical law." 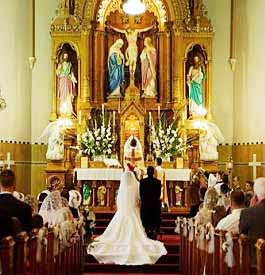 Husbands and wives must have the highest reverence for the sacrament of marriage, shunning any persons, places or things that may tempt them to be unfaithful to their vows, as much as any Christian in any vocation. How wonderful is the love of marriage pursued as a positive good, when any anything potentially contrary to the love of the spouses is far from thought or view and all efforts are spent with the desire of growing in the graced communion of Holy Matrimony. Jesus Christ is the "fulfillment of the law" so that God's love might open the freedom of every human person to the fullness of Life! Wed, Wk 5: "what comes out of the man ... defiles"
Monday, Week 5: "Let there be light"
... God saw how good it was. God is good and all His works are infinitely good. Henry and Thomas were friends. Their friendship was built largely around the enjoyment of earthly pleasures and worldly pursuits together as the king and his chancellor. But one day, in a desire to move against the power of God's Church, Henry named Thomas the archbishop of Canterbury. Thomas warned Henry that things would not turn out as he desired, that when the bishop's mitre is placed upon a man's head he is called to put the honor of God even above the friendship and love of a king. 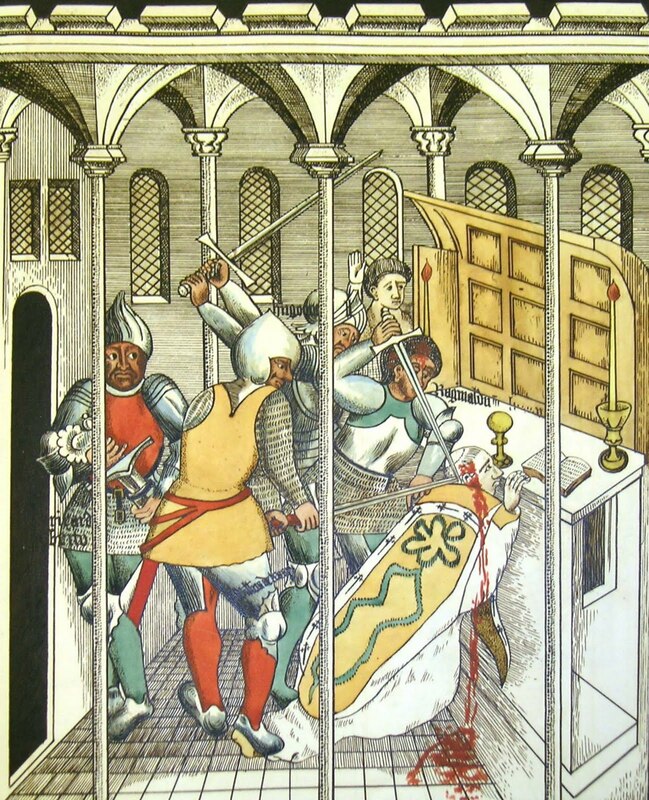 The story ends with the martyrdom of Thomas Becket in the cathedral and the shame of his former friend who in a moment of tormented agony seemed to be calling for his murder. Henry lives to see Thomas canonized a Saint and does public penance for his part in Thomas' murder. 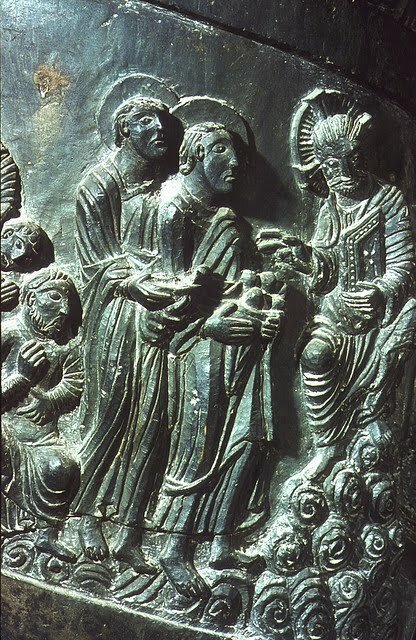 Thomas Becket lived as salt and light, as the praise of God's glory, refusing even the proffered friendship of the most powerful man, his king, in preference to the love of the honor of God. His witness continues to shine before us even today, guiding our own way of faith in this world of competing loyalties and lesser gods. What is this "faith" we share with Saint Thomas, which can transform us from weak and changing creatures into heros whose names are proclaimed down through the ages as Thomas' is today? We are free, made in God's image and likeness, and it is our free acceptance of loyalty to God above every other man or woman that opens us up to our greatest dignity, to live as "salt" and "light" bringing into the world in a fuller and more beautiful way that which can only come from God and not from men: his saving grace. This grace of faith, giving birth to our salvation and that of others, is the goodness of God which overcomes the cynicism and selfishness that refuses any good other than that of oneself, through conversion of heart to the true and lasting love of God. "- One becomes a member of this people not by a physical birth, but by being 'born anew,' a birth 'of water and the Spirit,' that is, by faith in Christ, and Baptism. "- 'Its law is the new commandment to love as Christ loved us.' This is the 'new' law of the Holy Spirit. 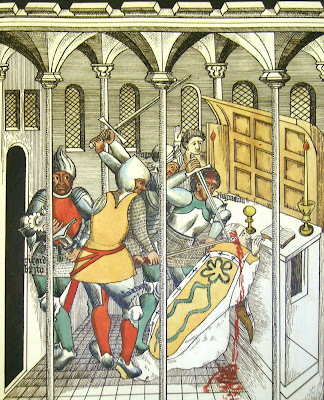 Through his witness Saint Thomas Becket salts others with the savor of Christ and through his persevering Faith unto martyrdom burns as a light on the pathway to heaven for those who follow. You are God's holy people, His Church, and through faith you live as the "salt of the earth and the light of the world". And as you act and speak in Faith, seeking His glory and honor above every earthly reality, you live as the praise of His glory now and forever. First Friday: "The LORD is my life’s refuge"
Death is transformed by Christ. Jesus, the Son of God, also himself suffered the death that is part of the human condition. Yet, despite his anguish as he faced death, he accepted it in an act of complete and free submission to his Father's will. The obedience of Jesus has transformed the curse of death into a blessing. 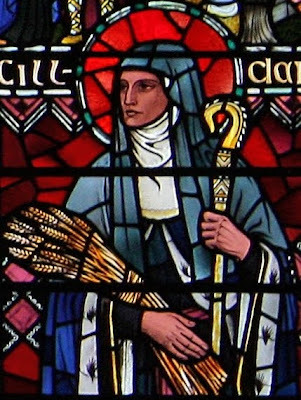 S Brigid of Ireland: "Since we are surrounded by so great a cloud of witnesses"
From the beginning, this one Church has been marked by a great diversity which comes from both the variety of God's gifts and the diversity of those who receive them. Within the unity of the People of God, a multiplicity of peoples and cultures is gathered together. 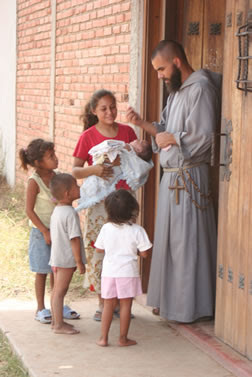 Among the Church's members, there are different gifts, offices, conditions, and ways of life. "Holding a rightful place in the communion of the Church there are also particular Churches that retain their own traditions." The great richness of such diversity is not opposed to the Church's unity. Yet sin and the burden of its consequences constantly threaten the gift of unity. And so the Apostle has to exhort Christians to "maintain the unity of the Spirit in the bond of peace."